With Millions Displaced by Climate Change or Extreme Weather, Is There a Role for Labor Migration Pathways? Home > With Millions Displaced by Climate Change or Extreme Weather, Is There a Role for Labor Migration Pathways? Even as huge attention in the past two years has been focused on the movement of people fleeing their homes due to war or political instability, far less attention has been given to the millions displaced by the effects of climate change or extreme-weather events. Yet a significant number—21.5 million people on average per year since 2008, according to the International Displacement Monitoring Centre—have been displaced by sudden-onset natural disasters, many from regions identified as “highly vulnerable” to climate change events. Thousands more have fled slow-onset hazards such as drought and coastal erosion. Almost all of this displacement occurs in developing regions. 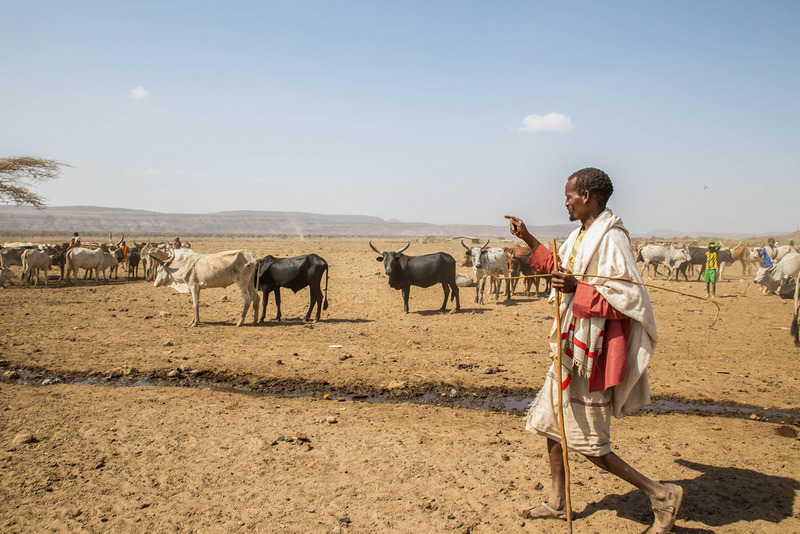 In the Horn of Africa, drought conditions have resulted in extreme food shortages and losses to livelihoods in areas inhabited by an estimated 70 million people. These conditions intersect with underlying social tension and can exacerbate conflict, as has been seen around Lake Chad and the Nile Basins. In the Pacific Island region, where extreme-weather events have struck with increasing regularity and severity, more than 70 percent of households in Kiribati and Tuvalu have said they intend to migrate if climate stressors worsen. For many in these areas, migration has become an important safety valve to adapt to changing environmental conditions or in extreme cases to assure their safety and survival. Few opportunities for legal migration exist for these populations, however. Some experts have proposed the expansion of labor migration channels as a potential solution. Experience demonstrates that when people do move, regardless of their motivations for moving, they will eventually enter the labor market to support themselves. In fact, most people who migrate find jobs: 150 million of the more than 200 million international migrants of working age are in the labor market, according to the International Labor Organization (ILO). Therefore, labor migration channels are a promising avenue both for migrants themselves and their destination countries, and can function as one tool of climate adaptation. This article explores the potential of regular labor mobility pathways to serve as a safe outlet for displaced populations in the areas most susceptible to the effects of climate change. In many regions around the world, climate migration is already a reality. This migration can be attributed to two types of natural dangers: sudden-onset events, such as tropical storms or other natural disasters, and slow-onset emergencies, such as drought and erosion. These drivers are often interconnected, as climate change can increase the risk of some natural disasters. While extreme weather events trigger large, immediate displacement, slower-onset emergencies are growing more common and persistent, and are driving greater numbers of people to migrate. Rising sea levels threaten to swallow low-lying island nations in the Pacific, such as the Marshall Islands and Kiribati. In response, former Kiribati President Anote Tong promoted “migration with dignity” for the country’s 110,000 residents and purchased nearly 6,000 acres in Fiji as a potential refuge. When Lake Poopó, the second largest lake in Bolivia, dried up entirely after shrinking for decades, many indigenous fishermen left to work in mines or salt flats up to 200 miles away. And in the Horn of Africa, the most severe drought in 60 years is intensifying migration already underway due to conflict in Somalia and is pushing others to leave Djibouti, Ethiopia, and Eritrea. In addition, climate-vulnerable regions are often heavily reliant on rain-fed agriculture, livestock, forestry, and fishery for both subsistence and livelihoods, making the consequences of climate change and a surge in extreme weather events all the more likely to trigger human mobility. In Niger, for example, ongoing drought conditions and increased flooding have undermined traditional livelihood activities and left many in the country food insecure. Evidence suggests that subsequent migration into Nigeria and onward toward Libya and Algeria, where drought conditions also plague the populations, has increased, as has the number of migrants departing from states on the coast of the Mediterranean toward Europe. Regardless of their motivation for moving, migrants can help fill key labor market shortages that may increasingly widen with demographic changes ongoing in Europe, Asia, and elsewhere. When migration is well-managed, the rights of migrant workers are respected and they have opportunities to transmit not only remittances to families at origin, but also newly acquired skills and knowledge, networks, and links to new markets. Destination communities ultimately benefit when migrants bring new vitality and when legal channels can help replace unmanaged and often-chaotic spontaneous flows. All too often, governments and employers do not protect the rights of migrant workers, forcing them to endure poor wages and working conditions, discrimination, and a fear of deportation if they complain. And amid rising concerns in many countries over immigration and a growing focus on inequality and stagnant wages for native populations, migrant workers may also face increasing hostility. It is against this political backdrop that migrants seeking refuge from climate disasters or slow-onset environmental change are forced to find ways to improve their lives and security. Migration management is often fragmented, with many key destination countries now narrowing their legal channels for migration. These barriers can serve to drive migrant workers into the informal economy where they may experience even more precarious situations. The risk of perpetuating dual economies and downward pressure on wages and benefits affecting all workers is not unimaginable. Despite this reality, the illusion of lucrative work opportunities abroad will continue to provide incentive to migrate, particularly for young workers who see little opportunity at home. When the natural resource base upon which so many workers rely is destroyed or depleted by extreme climate events, migration may be seen as a necessity. The recent surge of people making the dangerous journey across the Mediterranean, including many from climate-threatened areas such as the Horn of Africa, in search of better opportunities in Europe is evidence of desperation. For migration to be a safe and humane option for those most vulnerable to climate change, a significant shift toward greater regional and international cooperation would be necessary. Careful examination of actual labor market needs, with input from employers and worker organizations, would be more likely to result in the development of regular and safe labor mobility channels that are in line with human-rights obligations and international labor standards. The awareness of growing climate-induced migration is one reason the Paris climate change agreement put into motion the development of a task force to generate recommendations for integrated approaches to avert, minimize, and address displacement driven by climate change. The agreement not only recognized the importance of understanding various links between climate change and human mobility, but also put forth an integrated approach by inviting experts from several disciplines to develop the task force recommendations. In this regard, the world of work is an important dimension through which to understand the links between climate variables and mobility. Small-scale farmers, herders, and fishermen are among those most vulnerable to climate change events. This is not only because they rely on natural resources to supply their revenue and subsistence, but because they are also heavily concentrated in regions that are experiencing more frequent extreme-weather events and in areas with weak infrastructure, limited financial institutions, and few opportunities to diversify their income streams. They also may lack the skills and competencies that would allow them to transition into new occupations. As a result, these workers have fewer resources at their disposal to mitigate or adapt to destructive climate variables. Under these circumstances, workers who are healthy and young, particularly those with kinship ties elsewhere, may choose to migrate in search of better opportunities. Past experience has shown that rural populations—including workers from the middle class or working class—are more likely to migrate than urban populations. The decision to migrate is typically initiated at the household level in order to reduce economic vulnerability, with migration bringing an alternative source of income and offsetting the losses in livelihood that might arise due to climate impacts. The supply of more safe and regular mobility options can be part of a larger solution. Where people are already moving in response to climate variables, safe pathways have been developed in some cases—and could be in the future—to harness the development potential of migrant workers. Safe and regular labor mobility pathways can decrease the incentive for would-be migrants to use irregular, often times exploitative, channels. This does not necessarily mean promoting additional mobility, but to instead channel existing flows into regular pathways that target climate-affected populations. Bilateral labor mobility agreements between Spain and Colombia, as well as several Small Island States (such as Papua New Guinea) and New Zealand and Australia, for example, have integrated considerations for the development of climate affected areas into their seasonal worker programs. Workers from communities affected by climate change and/or natural disasters are given special consideration for work placement abroad. In the case of Small Island States, these arrangements have been instrumental in generating remittances in communities severely compromised by sea-level rise and flooding. In Spain, temporary agricultural work visas are supplied to workers from Colombia, targeting people from high-risk zones for natural disasters, including volcanic eruption. Similar schemes could have value for people in other areas of particular environmental risk, and this may warrant pilot testing in other contexts and regions. To be effective, institutional and regulatory frameworks would need to be aligned with international labor standards, human-rights law, and humanitarian law. These include the principles of equality of opportunity, nondiscrimination, adherence to fair recruitment principles, and social protection floors. The high cost of migration (for example, see ILO and World Bank studies on migration costs under KNOMAD) makes labor mobility an unfeasible option for the majority of workers in climate-vulnerable communities, particularly in developing countries. For labor mobility to play a role in adapting to climate change, policy reform, bilateral agreements, and regional consultation could represent means of reducing costs. Green Works Projects: A Double Adaptation Win? Facilitating the inclusion of climate-affected populations in labor mobility pathways can be a consideration within regions or smaller sub-regions. For example, strategic partnerships to invest in regional and national green infrastructure projects have been one way to support climate-affected communities, by stimulating labor demand and providing decent work opportunities close to home. In this area, international agencies, civil-society partners, and nongovernmental organizations have a wide variety of experiences generating sustainable employment opportunities for those most affected by climate change. In particular, ILO has a range of tools and policy mechanisms to support a transition to greener economies that minimizes harm to workers. Employment-intensive public employment programs (PEP) can have a large multiplier effect on vulnerable communities—affecting both native-born and migrant labor—by combining the social, environmental, and economic objectives of employment generation, income support, and asset creation. These projects also help to restore the natural resource base, reducing the local impacts of climate change. Community infrastructure projects, with an objective to construct or support green infrastructure, can be a source of decent work for climate-affected communities. In Mozambique, ILO partnered with the UN Environment Program to support the development of an employment-intensive investment strategy for government operations. ILO has used labor-based approaches over the years as a response to natural disasters or post-conflict crisis, such as in Haiti, Indonesia, Nepal, and the Philippines. Large-scale national PEPs, such as the Mahatma Gandhi National Rural Employment Guarantee Act in India and the Expanded Public Works Program in South Africa, have also employed labor-based approaches to protect biodiversity and water, and contribute to natural-resource management. Other ILO tools and technical inputs have been active in addressing climate change and provide a complementary set of lessons learned and practices that can be drawn on to formulate a comprehensive response. These include financial safety nets set up to help corn and rice farmers in the Philippines diversify their livelihood base; emergency employment programs deployed in the Philippines after Typhoon Haiyan to promote a labor-based rehabilitation of community assets; job opportunities for youth in Egypt through the development of composting and renewable energy services; and green jobs assessments conducted in Kenya, Mauritius, Namibia, Senegal, and Tunisia. If green works projects incorporate workers from climate-vulnerable communities, there can be a double adaptation win. Countries with labor shortages for this type of unskilled work could receive the labor required to boost adaptive capacity while migrant workers could gain practical skills in green construction and support resilience at home through remittances or returning with higher skills to help rebuild their own communities. For these opportunities to become a reality, workers and employers from sending and receiving countries need to be brought to the table as governments and regional bodies develop cooperative strategies. There is a dearth of data in many low- and middle-income countries on labor migration patterns, the skills of native-born and migrant workers, and labor market needs. Collecting reliable labor market information is an important step for considering how genuine labor shortages may be linked to improving the skills of youth or other workers in climate-vulnerable communities. In this respect, labor market analysis, including value chain development and analysis of the potential for green job creation, could strengthen the supply of decent work opportunities while taking into account future expected impacts of climate change on labor markets. ILO assessments on the potential for green jobs have already helped guide the development of employment policies in Bangladesh, China, Lebanon, Mauritius, Mexico, Mozambique, and Portugal. Beyond recognizing skills and competencies, further efforts are necessary to help workers acquire new skills or strengthen existing ones. In some cases, language proficiency is an additional area for consideration. In this regard, ILO launched a vocational training program in automotive and motorcycle mechanics, targeting young migrant workers in Thailand. The training was accompanied by four months of Thai language training, placing the workers in a better position to learn further skills and competencies for their advancement. Bilateral and regional agreements can also be used to help ensure that human mobility contributes to personal and community development and includes highly vulnerable groups, such as those fleeing climate-induced change. Practical measures may include strengthening labor inspection in receiving countries, promoting fair and ethical recruitment practices, and conducting information campaigns about decent work opportunities. Fair recruitment, based on ILO standards and guidelines, can make a difference in fostering positive development outcomes for migrants and improve skills and job matching. Strengthening national capacity to support the collection and dissemination of reliable labor market information and analysis of environmental impacts. Mobilizing national expertise to map climate vulnerabilities at the regional and national levels with a focus on climate-vulnerable sectors and the populations that fill them. Developing mechanisms, regional standards, and bilateral arrangements to support the portability and recognition of social security arrangements for workers outside their own countries. Developing adaptation plans that link the adverse effects of climate change with a greater need for legal, safe, fair, and regular channels for labor mobility. Coordinating regional recognition of groups that are vulnerable to extreme-weather events, slow-onset events, and natural disasters based on reliable evidence. Examining the special needs of women, youth, and vulnerable groups in examining linkages between labor mobility and adaptation-planning labor mobility agreements. As the effects of climate change intensify, they are likely to cause greater displacement in the future. For populations repeatedly exposed to extreme-weather events and natural disasters who may be vulnerable to displacement, what does a just transition to sustainability entail? The answer: an integrated approach that minimizes the risk of displacement in the first place, while also addressing human mobility already underway. Addressing root causes and building resilience is also at the heart of ILO guidelines for a just transition to sustainable economies and societies for all. Labor is at the intersection of both. Where mobility is already taking place in response to climate events, regular labor mobility pathways can provide a safe and well-managed option for workers who have lost their livelihoods at home. Whether or not the international community delivers on the commitments made under the Paris accord, people will continue to move within and beyond climate-affected regions. Migration can make significant contributions to poverty eradication and economic development if undertaken in a manner that is safe for the migrant and beneficial for both countries of origin and destination. Climate-driven labor mobility must, however, be part of a larger solution on adaptation strategies that reflects respect for international human-rights obligations and international labor standards. Abella, Manolo and Philip Martin. 2014. Key Findings from KNOMAD Pilot Surveys in Korea, Kuwait, and Spain. Draft report, KNOMAD, Washington, DC, May 2014. Available online. Aleksynska, Mariya, Samia Kazi Aoul-Chaillou, and Veronica Petrencu. Forthcoming. Deficiencies in Conditions of Work as a Cost to Labour Migration: Concepts, Extent, and Implications. Washington, DC: KNOMAD. Casey, Nicholas. 2016. Climate Change Claims a Lake, and an Identity. New York Times, July 7, 2016. Available online. DARA and the Climate Vulnerable Forum. 2012. Climate Vulnerability Monitor 2nd Edition: A Guide to the Cold Calculus of a Hot Planet. Madrid: DARA and the Climate Vulnerable Forum. Available online. Heimann, Liz. 2015. Top 10 of 2015 – Issue #7: Climate Change and Natural Disasters Displace Millions, Affect Migration Flows. Migration Information Source, December 10, 2015. Available online. Intergovernmental Panel on Climate Change (IPCC). 2014. Climate Change 2014: Synthesis Report, Contribution of Working Groups I, II, and III to the Fifth Assessment Report of the IPCC. Geneva, Switzerland: IPCC. Available online. Internal Displacement Monitoring Centre (IDMC). 2016. Seizing the Momentum: Displacement on the Global Climate Change Agenda. Geneva: IDMC. Available online. International Labor Organization (ILO). 2015. Guidelines for a Just Transition toward Environmentally Sustainable Economies and Societies for All. Geneva: ILO. Available online. ---. 2012. The Climate Change Adaptation Project on Building Climate Resilient Farming Communities in Agusan del Norte through Innovative Risk Transfer Mechanisms. Surabaya, Indonesia. Available online. ---. 2015. ILO Global Estimates on Migrant Workers. Geneva: ILO. Available online. ---. 2015. ILO’s Assessments on Green Jobs Potential. Resource list, January 15, 2015. Available online. ---.2016. Fair Migration with a Focus on Recruitment. Supplement to the Report of the Director-General to the 16th Asia-Pacific Regional Meeting, ILO, Geneva, November 2016. Available online. ---. 2016. General Principles and Operational Guidelines for Fair Recruitment. Adopted by the Meeting of Experts on Fair Recruitment, September 5-7, 2016. Available online. ---. 2016. Decent Work in Global Supply Chains. Report IV from the International Labour Conference 105th Session, ILO, Geneva, June 2016. Available online. ---. N.d. Decent Jobs for Egypt’s Young People: Tackling the Challenge Together. Project description. Accessed December 29, 2016. Available online. ---. N.d. Emergency Employment and Livelihood Recovery for Super Typhoon Haiyan (Yolanda): Coron, Palawan. Project description. Accessed December 29, 2016. Available online. International Organization for Migration. 2016. Mediterranean Update. Available online. Ives, Mike. 2016. A Remote Pacific Nation, Threatened by Rising Seas. New York Times, July 2, 2016. Available online. Leighton, Michelle. 2011. Drought, Desertification, and Migration: Past Experiences, Predicted Impacts, and Human Rights. In Migration and Climate Change, eds. Étienne Piguet, Antoine Pécoud, and Paul de Guchteneire. Cambridge, UK: Cambridge University Press. United Nations. N.d. Summit for Refugees and Migrants – 19 September, 2016. Accessed December 29, 2016. Available online. United Nations High Commissioner for Refugees (UNHCR). 2015. Global Trends: Forced Displacement in 2015. Geneva: UNHCR. Available online. UN Economic and Social Commission for Asia and the Pacific (UNESCAP) and UN University Institute for Environment and Human Security (UNU-EHS). 2015. Climate Change and Migration in the Pacific. Bonn: UNESCAP and UNU-EHS. Available online. UN Environmental Program (UNEP). 2011. Food Security in the Horn of Africa: The Implications of a Drier, Hotter and More Crowded Future. UNEP Global Environmental Alert Service, November 2011. Available online. UN Framework Convention on Climate Change (UNFCCC). 2016. Executive Committee of the Warsaw International Mechanism for Loss and Damage Associated with Climate Change Impacts. Technical meeting concept note, July 29, 2016. Available online. Webber, Michael and Jon Barnett. 2010. Accommodating Migration to Promote Adaptation to Climate Change. Background Paper to the 2010 World Development Report, World Bank, Washington, DC, April 2010. Available online. Werz, Michael and Laura Conley. 2012. Climate Change, Migration, and Conflict: Addressing Complex Crisis Scenarios in the 21st Century. Washington, DC: Center for American Progress. Available online. Wickramasekara, Piyasiri. 2015. Bilateral Agreements and Memoranda of Understanding on Migration of Low Skilled Workers: A Review. Geneva: ILO. Available online.